Explainer videos (sometimes called promo videos) are informative videos, usually less than 5 minutes long, that explain what a company does or how a product works. Usually they are hosted on a business’ homepage and can lead to higher levels of engagement on your site. Think about it, wouldn’t you rather learn about something new by watching a video than reading a bunch of text? I’m sure you’re thinking that shooting even a short explainer video for your business’s website will be prohibitively costly. That’s not necessarily true; you just need to know your options. You can either find a local production company to work with or hire a filmmaker through a platform like 99designs and get a high-quality video production for under a thousand dollars. But even that may be outside some companies’ budgets. In that case you might want to try shooting your own explainer video, but you want it to look professional. A bad video is worse than no video at all. And that’s why I’m here, to show you how you can shoot your own explainer video and have it look good. If you’re not going to hire a videographer, recognize that you’re not going to shoot something that looks like a television commercial. Those can cost millions of dollars and require hundreds of crew members. Your explainer video will be very simple and straightforward. There’s nothing wrong with that. The owner of a small business, speaking directly to the camera, can be a powerful marketing tool. You can even make a virtue of necessity by playing up the hand-crafted nature of the film. Have fun with it, perform a little cheesy if you want. You never know what kind of silly video will go viral. If you really need a glossy, professional looking production, you should hire a professional. You’ll want to find a location that is emblematic of your company. It could be your office, your factory floor, your exam room or somewhere else entirely. I don’t know what business you’re in. It’s helpful to employ the iconography of your profession, though. A lawyer should have a shelf of law books; a musician should have instruments; a doctor should have different instruments. Another issue is whether you’ll be speaking or not. Marketers have long known that the most interesting thing to a human being is another human. I highly recommend beginning your promo video with a close up shot of yourself. If you’re speaking, we want to be able to hear you. So, choose a location that is as quiet as possible. And I mean quiet. Stand in the space, close your eyes and really listen. Do you hear traffic through the window? Is there a refrigerator running? Is the air conditioner humming? All of these are issues you don’t want to deal with when you’re trying to edit it all together at your computer. Figure out how to turn off or cut out as much of this as possible. Lastly, check the lighting. Does your space have natural light? Is it coming from above? That’s bad. Is it coming from the side? That’s better. Is it lit by fluorescent tubes? That’s the worst. Turn those off. You don’t need the fanciest camera in the world, since your video will most likely wind up on Vimeo or YouTube. Most still cameras nowadays shoot in high definition, which is good enough for online viewing. You definitely want to be able to adjust the brightness setting on the camera so you can see everything clearly. More importantly, you want to be able to turn off automatic brightness. The main thing is, you don’t want the brightness of the scene to shift as you’re shooting. This will make it impossible to edit later. If you’re not sure whether you’re using a digital or real zoom, the easy way to check is, is there an actual moving part when you zoom in or out? If not, don’t use it. The one item you probably don’t own but definitely need to rent (or buy) is a lavalier microphone. The built-in microphone in your camera will simply not cut it. Have you ever seen a behind-the-scenes photo of a film set, where someone is dangling a fuzzy, Muppet-looking thing a few inches above the actors? That’s a microphone, and that is exactly how close a microphone needs to be to hear your dialogue clearly. Check a local film rental house (most big cities have at least one), and look for a lav mic with a cord. These are tiny microphones that clip to your collar. Confirm that your camera has a mic input, and confirm the lav has the same kind of plug. When you go to pick it up, bring your camera with you. Plug it in, and make sure it works. If it doesn’t, ask the rental agent if you’re using it correctly. Lastly, you’ll need lights. The most flattering kind of lighting is soft lighting (meaning the shadows they cast have blurry edges, rather than sharp, defined lines). Fluorescent lights are usually soft, but unless you have specialty film, fluorescents will cause all kinds of problems with your skin color, as well as flicker out of sync with your camera. A simple, convenient way to create soft light is with a china ball. It’s basically a paper ball wrapped around an incandescent bulb. A clamp light or work light will provide a lot of light, but will also be harsh. You can solve this by hanging a thin, white sheet in front of it. If you are shooting in a place with windows, this can serve as a light, too. Just make sure you’re filming at a time of day when the sun is not directly shining in the windows while you film. Suncalc.net will help you figure that out. You’ve found the location, decorated it appropriately and figured out what you’re going to say. Now it’s time to light the scene. 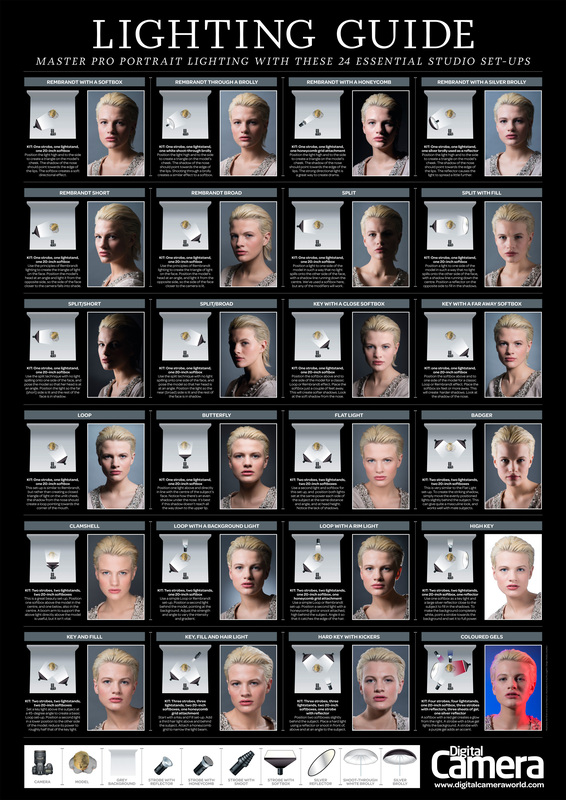 The most versatile and useful form of lighting (for a single subject who’s not moving) is Three Point Lighting. There are three basic elements, as you might have guessed—the key light, the fill light and the back light. The key light is your main light source. The most flattering angle, typically, is pointing straight at the subject’s face, slightly elevated and a little off-center. This will, of course, create shadows on the other side of the subject’s face. If you’re using the window as a light source, this will almost certainly be your key light. That’s where the fill light comes in. It should be set up on the opposite side of the subject’s face, a little bit lower than the key light. It’s generally more aesthetically pleasing if the light is a bit dimmer, too; if you don’t have control of the power of the light, simply back it up a bit. Then, add the backlight, sometimes called a hair light. Place this behind the subject, directly across from the key light, and likewise elevated. This creates a kind of halo around the subject, separating them from the background. Speaking of the background, once all the light is centered on the subject, it will probably appear dark. That’s okay, because you want the audience to focus on the person speaking, not the background. But if it’s too dark, like the person is just floating in a black void, you may want to add another light to the background. I recommend putting it low and at a canted angle; this will create some visual interest without just brightening the whole scene. The center of the shot is almost always the area where viewers will focus their attention. They also tend to look at the brightest part of the frame, which is why we light the subject in a way to separate the subject from the background. And, of course, we’re drawn to human faces. So, I recommend, when speaking directly to the camera, centering the speaker horizontally in your shot. If you choose to shoot a close-up (which should include the person’s shoulders to the top of their head), their eyes will be roughly in the middle. Mr. Robot is about a crazy person living in a world of lies and deception. Probably not the impression you want to give of your company. Via USA Network. A medium shot (from the waist or torso to the top of the head), will put the speaker’s head slightly above center. That’s okay; too much space between the person’s head and the top of the frame is weird. Watch any episode of Mr Robot for an example. I don’t recommend shooting a full-body shot, unless you intend to use your full body. If you’re a yoga instructor demonstrating some techniques, great. If you’re a malpractice attorney, standing stock still from the waist down is very dull. If you have two cameras, a common way of shooting is called “Wide and Tight.” You zoom one camera into a close-up. You place the other camera as close as physically possible, either right next to or on top of, the other camera. Zoom that one out to the medium shot. If the subject addresses the close-up camera, it won’t look too off on the medium. Check the frame to be sure, though. If you want to have a little variety in your cutting by separating the cameras, remember the 30/30 rule: to cut from one shot to another without appearing strange, the angle must change by 30 degrees, or the size must change by 30%. Unless, of course, you’re going for MTV-style jump cuts, in which case, put the cameras wherever you like. Go nuts! If you don’t want that crazy music video aesthetic, put the cameras on tripods and don’t move them. Your hands aren’t as steady as you think they are. Before the subject begins, perform what we call in Hollywood “last looks.” This means, checking that the make-up looks right, the hair is in place, things like that. Look at each corner of the frame; do you see something distracting? Remove it. Does it look like a potted plant is growing out of the speaker’s head? Get rid of that, too. Deliver your pitch at least five times. You won’t get it right the first or second time, I promise. If you flub a line, don’t just pick it up again; it will be useless in the editing room. Instead, pause, take a breath, then back up two sentences. That should give you enough room to merge the takes together later. Once you think you’ve given at least two solid performances all the way through, do one more, silly this time. Be goofy, ham it up, have fun. You might not use any of it, but then again, who knows? You totally might. Finally, shoot some stuff that isn’t you talking to the camera. If you’re a dance instructor, record an entire dance lesson. If you’re a graphic designer, set up a camera in your work area and film yourself designing something cool. This gives you something to cut away to during the video. Someone delivering a three minute monologue straight to camera will get dull after 45 seconds. But if you can visually demonstrate whatever you’re talking about, all the better. Once you’re done filming, you might be wondering what to do with all this footage you just shot. Now’s the time to edit it. Check out our post on how to edit your explainer video. It is possible to shoot your own explainer video and look professional doing it. It doesn’t cost a lot of money; just patience and attentiveness. It won’t look like a Spielberg movie, but it’ll be better than a selfie on your iPhone. Give it a shot and with the advice above you’ll be able to create something great. And remember: if you end up deciding that you want the high-end, professional look, you can always team up with a filmmaker who knows all the ins and outs of shooting an explainer video.